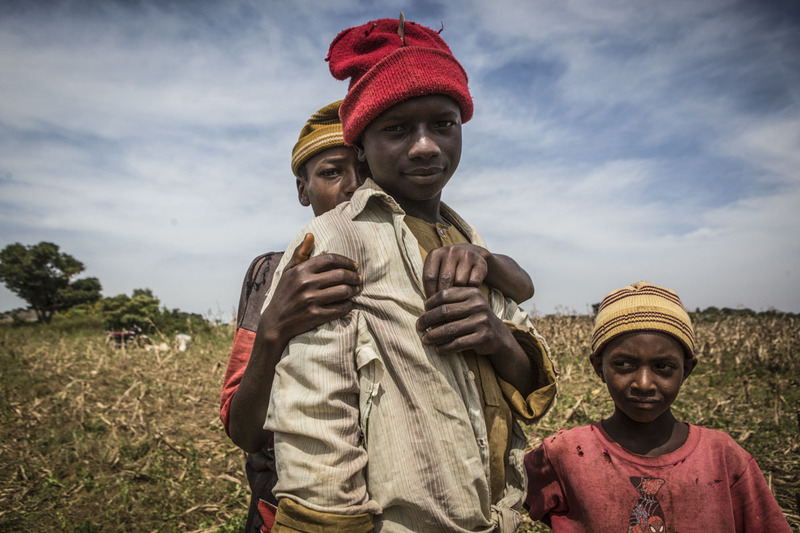 Barkin Ladi, Jos, Nigeria- Herders Zaidu, (c) Mohammed, 10, (l) and Abibakar, 6, pose for a photo outside of Makoli Vilage in Barkin Ladi, Nigeria on Tuesday, October 23, 2018. Makoli Village was saved by the Fulani herders belonging to that community when masked gunmen attempted to attack in June 2018. Growing animosity between ethnic groups coupled with a lack of security has fomented this increase in violence in recent years. Despite the divisive chaos engulfing the Middle Belt of Nigeria, a group of multi-ethnic men and women, part of the Vigilante Group of Nigeria, are providing much needed security and trust to all groups affected by the conflict.